This is a good tag I get from Rozella to help promote awareness of breast cancer. I'm sure the issue of breast cancer is painfully close to many people's hearts. To reduce the number of mothers, sisters, daughters and friends lost to this disease, The Breast Cancer Site was founded to help offer free mammograms to women in need, with a particular focus on minorities, low-income, and working-poor women. Join their efforts together to protect women's health. 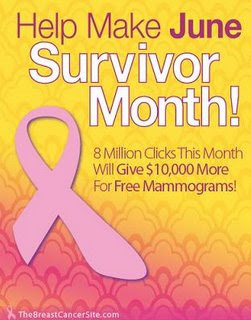 Just click the pink button at The Breast Cancer Site as many times as possible in order for their premier sponsor to donate $ 10,000 for more free mammograms by this month. Nightwing, Molly, Jacky, Simon and Andrey please help and spread the word about The Breast Cancer Site and remember to click every day. Thanks for getting this done so quickly :) I hope with all our blogging efforts, they will reach 8 millions clicks in no time! Hi Monica, Good what you doing. Only last year we lost a lady friend, she an ex Malaysian living here, we grew up in KL quite close by. She never went, and even though medical is free for everyone here, she never went even when felt some pains in her left breast. By the time she decided to go, the doctor said it was too late, gave her less than 6 months. She passed away in four, leaving behind her loving hubby and daughter. My wife goes yearly as well a 100% medical check up too. You don't forget yourself, Monica. so sad to hear about your friend :-( I guess I must go for yearly medical check up as well soon.. I've yet to post this up myself! Better do it soon! Ok ok, since this is for charity, I'll do this tag.